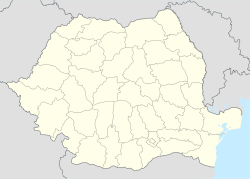 Iara (Hungarian: Alsójára; German: Jahren) is a commune in the southern part of Cluj County, Romania. It is composed of thirteen villages: Agriș (Ruhaegres), Borzești (Berkes), Buru (Borrév), Cacova Ierii (Aranyosivánfalva), Făgetu Ierii (Bikalat), Iara, Lungești (Szurdoklunzsest), Măgura Ierii (Járamagura), Mașca (Macskakő), Ocolișel (Felsőaklos), Surduc (Járaszurdok), Valea Agrișului (Egrespatak) and Valea Vadului (Vádpatak). According to the census from 2002, the total population of the commune was 4,704 people. Of this population, 90.68% were ethnic Romanians, 6.01% ethnic Romani and 3.16% are ethnic Hungarians. ^ "Population as of July 1, 2007" (in Romanian). INSSE. April 4, 2008. Archived from the original on August 7, 2010. Retrieved May 4, 2008. This Cluj County location article is a stub. You can help Wikipedia by expanding it.